Nine people were arrested after deputies say they smuggled K-2 synthetic cannabinoids into a Polk jail near Frostproof. 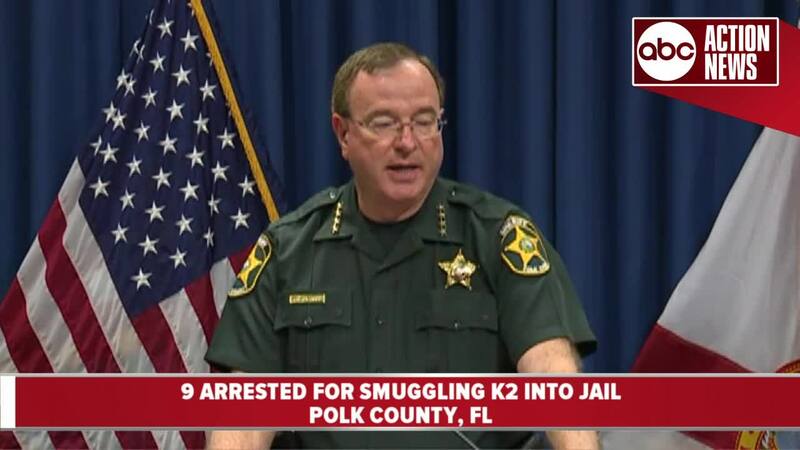 POLK COUNTY, Fla. — Nine people were arrested after deputies say they smuggled K-2 synthetic cannabinoids into a Polk jail near Frostproof. An investigation that started in May uncovered that inmates housed together in H dorm, along with friends and family outside the jail, were involved in the active conspiracy to smuggle K-2 into the jail. The investigation found a total of $4,500 in transactions of K-2 that either entered or were attempted to be sent to the jail. The cannabinoid compounds were reportedly being sprayed on sheets of paper, then those sheets of paper were being brought into the jail. The papers were disguised by writing legal information, personal messages and bible verses on them. Those papers were mailed to the jail using fake or appropriated law firm stationery, and in some cases brought in during meetings with an attorney at the jail. In August detectives set up an undercover purchase with the outside source, 29-year-old Holly Boulanger, of five sheets of paper, sprayed with liquid K-2. In September, detectives arranged another undercover purchase of eight sheets of the paper. They then conducted surveillance on Boulanger's home and served a search warrant. In the search, detectives located 52.2 grams of paper sprayed with K-2. They also found two plastic containers with a brown colored liquidone of the containers had a spray top. The total packaged weight of both of these containers of liquid are 165.4 grams and 612.6 grams. The chemical product seized is believed to be liquid K-2 or Synthetic Cannabinoids. A two-year-old boy living in the residence where the chemicals were found was turned over to case workers with the Florida Department of Children and Families. They assumed custody and care of the child. Detectives also found that an attorney, 29-year-old Sara Jones, was responsible for passing some of the K-2 laced papers into the jail. According to the Sheriff's Office, all those arrested during this investigation were either involved in purchasing, arranging the delivery of, or introducing or attempting to introduce contraband (synthetic cannabinoids/drugs) into the South County Jail near Frostproof. They include inmates, and family members or friends outside of the jail. Charges have been filed on Wednesday and Thursday, September 5th and 6th. Charges: aggravated assault with a weapon without intent, armed burglary with assault/battery, possession of a firearm by a convicted felon, discharging a firearm in public, aggravated assault with a deadly weapon without intent. Coleman's criminal history includes 44 felony charges, 33 misdemeanor charges, and 2 state prison incarcerations. County, Florida, 33805. Charges: Conspiracy to Introduce Contraband into a County Detention Facility (F-3), Florida Statutes 777.04 and 951.22 and Unlawful Use of a Two-Way Communication Device (F-3), Florida Statutes 934.215. Smith's criminal history includes 6 felony charges and 7 misdemeanor charges. Polk County, Florida, 33843. Charges: Conspiracy to Introduce Contraband into a County Detention Facility (F-3), Florida Statutes 777.04 and 951.22 and Unlawful Use of a Two-Way Communication Device (F-3), Florida Statutes 934.215. In Jail With Previous Charges: robbery with a deadly weapon (3 counts), armed burglary with assault/battery (firearm), armed false imprisonment (3 counts), conspiracy to commit armed robbery, grand theft, robbery (4 counts), aggravated assault with a deadly weapon without intent. Zachary Bitner's criminal history includes 30 felony charges, 17 misdemeanor charges, 5 failures to appear and 3 incarcerations in state prison. He is currently in state prison serving a life sentence. Charges: Conspiracy to Introduce Contraband into a County Detention Facility (F-3), Florida Statutes 777.04 and 951.22 and Unlawful Use of a Two-Way Communication Device (F-3), Florida Statutes 934.215. Bitner had no criminal history. Florida, 33849. Charges: Introduction of Contraband into a County Detention Facility (F-3), Florida Statutes 951.22, Conspiracy to Introduce Contraband into a County Detention Facility (F-3), Florida Statutes 777.04 and 951.22 and 2 Counts of Unlawful Use of a Two-Way Communication Device (F-3), Florida Statutes 934.215. Cole has two prior misdemeanors. Frostproof, Polk County, Florida, 33843. Charges: Conspiracy to Introduce Contraband into a County Detention Facility (F-3), Florida Statutes 777.04 and 951.22 and Unlawful Use of a Two-Way Communication Device (F-3), Florida Statutes 934.215. In Jail With Previous Charges: tampering with physical evidence, conspiracy to commit first degree murder, possession of a firearm by a convicted felon, first degree murder. Garst's criminal history includes 7 felony charges and 2 incarcerations in state prison. 7. Joanna Juliano, h/f, 01/28/1984; North 9th Street, Frostproof, Florida. Charges: Conspiracy to Introduce Contraband into a County Detention Facility (F-3), Florida Statutes 777.04 and 951.22 and Unlawful Use of a Two-Way Communication Device (F-3), Florida Statutes 934.215. Juliano has one prior misdemeanor. 33850. Charges: Unlawful Use of a Two-Way Communication Device (F-3), Florida Statutes 934.215, Trafficking in synthetic cannabinoids (K-2), Possession of Drug Paraphernalia, Maintaining a dwelling/conveyance for drug use/sale. Boulanger's criminal history includes 5 felony charges, 19 misdemeanors, and 2 failures to appear. Florida, 33850. Charges: Maintaining a dwelling for drug use/sale with a minor child present, Possession of Alprazolam (Xanax), Possession of Clonazepam, Possession of Drug Paraphernalia, Trafficking in synthetic cannabinoids (K-2). Kirby's criminal history includes 12 felonies, 6 misdemeanors, and 1 failure to appear.